There is nothing worse than a throbbing head. The pain, the intense ache, the inability to get rid of something that can be so debilitating. In the United States, over 37 million people suffer from migraines, and 2-3 million of those migraine sufferers are labeled as chronic. While there are many things that can potentially cause headaches, here are some things that might surprise you that can trigger one. Knowing these facts can potentially help you eliminate the use of these products or change your habits to prevent painful issues in the future. While they might smell good, store bought room sprays and plug-ins contain chemicals like formaldehyde, phthalates, benzene, styrene, and other toxic agents that are hidden within the product but not listed on the label. According to the Environmental Working Group, these known allergens and toxins are researched and proven to be carcinogenic, extremely disruptive to the respiratory system and endocrine system, and can be a main cause of headaches for many people. Our family threw away all room sprays and plug-ins and began diffusing essential oils instead, which cleanse and purify the air without any toxins, as well as make our home smell good. Some of our favorite essential oils to diffuse are Lavender, Lemon, Peppermint, or blends like Thieves, Purification, or Stress Away. This one made me sad, because I was a huge candle-burner in my day before I knew the risks. Like room sprays or other fragrances designed for the home, most store-bought candles contain tons of toxic chemicals that can emit from the fumes when burned. The University of Melbourne did a study that showed how certain scented candles contained chemicals like benzene and toluene, which can damage the brain, nerves, lungs, and cause some gnarly headaches, too. We have been able to create some amazing scents that remind me of my favorite candles by diffusing essential oils, too. This is a perfect chemical-free option that is safe for everyone in the family to be exposed to. My husband's favorite diffuser blend is 3 drops Lemon, 3 drops Peppermint, and 4 drops Thieves. My favorite diffuser blend is 4 drops Bergamot, 3 drops Lavender, and 4 drops Copaiba. I remember times when I would clean my house with conventional window sprays, countertop cleaners, mopping liquids, and dish soaps that would leave me with raging headaches - so much so, that I would make every excuse I could NOT to clean. Not to mention, the fear of my children exploring under the sink and coming in contact with these toxic products was absolutely terrifying. If the "call poison control" warning on the back of isn't scary enough, household cleaners contain harmful chemicals such as formaldehyde, perchloroethylene, 2-butoxyethanol, quarternary ammonium compounds, triclosan, sodium hydroxide, ammonia, and chlorine. If you plug these chemicals into the database on the Environmental Working Group website, you'll see they're some of the most damaging and dangerous chemicals that you can ever expose yourself (and your family) to. They can easily cause headaches, but also can cause other health issues that could be horrifyingly detrimental to the body. We have ditched all of the stuff we previously had under our sink and simply switched over to natural cleaning products like Thieves Household Cleaner (which safely and effectively cleans EVERYTHING - countertops, floors, toilets, windows, mirrors, you name it) , Thieves Dish Soap, Thieves Laundry Soap, and even the Thieves Foaming Hand Soap. These products are plant based, safe for the body, highly cleansing, and aromatically pleasing, too. Sorry to burst your bubble, girlfriends - but your favorite creams, makeup, face wipes, or cleansers could be having a major negative effect on your body - and yes, even contributing to unneccesary headaches. The average woman applies over 300 chemicals to her face and body even before eating breakfast - those chemicals including parabens, isopropyl alcohol, mineral oil, polyethylene glycol, sodium lauryl sulfate (SLS), sodium laureth sulfate (SLES), color pigments, talc, fragrances, and phthalates. Overuse of products with these chemicals contribute to headaches, and other dangerous symptoms that can deeply damage the body and immune system. I, personally, had a hard time letting go of my favorite beauty products, mainly because I hadn't found any "natural" options that I liked better - that is, until recently. I now use Savvy Minerals makeup, the ART skin care line, and other natural beauty products that have left my face, hair, and skin feeling fresh, beautiful, and guilt-free due to the perfect plant-based ingredients. Click here to watch videos on my makeup and skin care routines. Store bought perfumes are artificial fragrances. In fact, the word "fragrance” is simply a broad category hiding potentially hundreds of toxic chemicals. Perfume companies are not required to reveal the actual chemicals that are within their fragrances, hence keeping you in the dark about the true toxicity of what you're spraying or applying on your skin. The toxic chemicals in perfumes have the potential to cause major headaches and migraines, on top of birth defects, cancer, nervous system disorders, allergies, reproductive issues, and so much more. Instead of perfumes, I now use essential oils instead. And yes, my husband uses essential oils as a natural cologne, too! His favorites to wear are Shutran, Idaho Blue Spruce, and Frankincense. I created a DIY perfume with a custom blend of essential oils for myself, too, and talk about it in my most recent "Natural Perfume without the Toxins" blog post. This one was quite surprising to me, but it actually makes perfect sense. People who are prone to headaches and migraines can have a sensitivity to sensory input, and the brightness of certain lightbulbs can cause anywhere from mild to severe head pain, as explained by Deborah Friedman, MD, a neurologist at the University of Texas Southwestern Medical Center. When we originally moved into our house, the previous owner had left a whole box of LED energy-saving light bulbs in a cabinet. Being that we were wanting to cut down on unnecessary costs, we used those available bulbs in our lamps and ceiling fans. Over time, we realized it was causing us to get headaches more frequently, and even straining our eyes when the lights were on. We switched over to incandescent light bulbs and softer lighting with less wattage, and we have never had a problem since. We are a technological world today. Most people work on computers or smartphones for hours and hours per day, and even wind down at night by watching their favorite Netflix series. Yet, our eyes are straining to read small print on cell phone and computer screens, which can cause head tension and pain. On top of that, computers and cell phone screens have excessive levels of blue light, which can bring fatigue and sensitivity to the eyes. Ways to prevent this are to buy an antiglare screen protector for your computer or phone, or even blue light glasses to wear while using your device (get $5 off a pair here with promo code HANNAH5). If you have an iPhone, you could also turn your screen settings to "night shift," which eliminates a majority of blue light levels. Other options are simply to cut down your computer, phone, or TV time, or look away for a few minutes to give your eyes, and head, a break. Ever notice how when you wear that one pair of earrings, you immediately get a splitting headache? 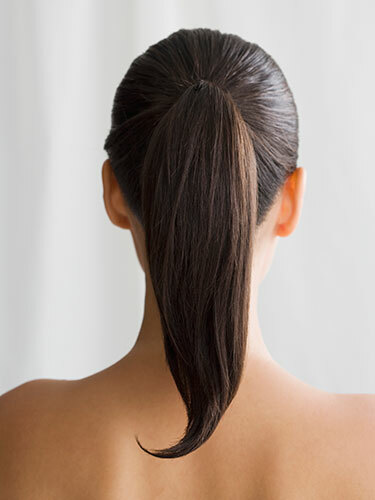 Or the relief you feel when you release your hair from the rubber band holding your ponytail together? Or how much pain a little bobby pin can cause? I know it's frustrating, but sometimes jewelry and hair accessories are major contributors to headaches. The pressure that is being applied over long periods of time on the scalp or earlobes can cause nerve sensitivity and produce head tension. Wear your hair down, consider styling your hair with different tools, avoid wearing clip-on earrings, or choose to wear earrings that are lighter in weight. Sort of the same as jewelry or hair accessories, sometimes the long use of glasses or sunglasses can be what causes a headache. Pressure on the upper bridge of the nose or behind the ears can be the very thing that is radiating pain straight to your head, and sometimes cause your head to hurt even long after you remove your eyewear. Contacts are an option if you experience this on a daily basis. Other times, getting a new prescription could be exactly what you need, because your eyesight and vision could change over time. Or, in my experience, I began to purchase glasses and sunglasses with plastic brims that have built-in nose pads. The protruding nose pads on my former thin metal glasses were what gave me splitting headaches in the past. 1) Sulfates: Found in alcoholic beverages. These are preservatives that can increase blood flow to the brain and cause dehydration, hence triggering a headache. 2) Caffeine: Some people who are addicted to caffeine can experience withdrawals when they don't have caffeine, hence triggering a headache. Or, sensitivity to caffeine can bring on a headache, too. 3) Tyramine: Things like cheese and even bananas can contain tyramine. It's a substance that forms when the proteins in those foods break down over time. Aged cheese, especially, has higher levels of tyramine. 4) MSG: Monosodium Glutamate (MSG) is a food additive that is known to be extremely damaging to your health, and is found in many non-organic foods, processed foods, and in things like soy sauce. It's been found to cause cramps, diarrhea, and migraines in 10%-15% of people. 5) Nitrites / Nitrates: Found in processed foods like hot dogs, bacon, and lunch meats. These are preservatives that are known to dilate blood vessels and trigger headaches. In order to pinpoint what in your diet could possibly be triggering your headaches, you can keep a food diary and narrow it down there. Also, simple elimination of these preservative and chemical-laden foods can bring drastic improvement, as well as switching to a dairy-free, gluten-free, or all-organic diet. Is there something that triggers a headache for you that is not on this list? Comment below and tell us - KNOW BETTER, DO BETTER! Newer PostHealthier alternatives to WINE? Is that even a thing? Older PostWe Pay $450/month for Healthcare. That's It.